La Tania is the youngest ski destination in the extensive ski region of Les Trois Valée. This village was never more than a small village between Meribel and Courchevel, but in the 1980s it was completely renovated and transformed into a beautiful resort. La Tania is a car-free, family friendly and humble village in the heart of the largest ski area in the world! Due to the use of natural materials in the accommodations, the village has a pleasant appearance. La Tania is not a place known for its après-ski, but there is plenty to do in the evening! Most evenings there is live music and parties in the various bars and cafés. La Tania is situated on an altitude of 1400 meters and via a gondola lift there is a direct connection to the ski resort of Les Trois Vallées. From the Col de la Loze you can ski back over a black, red or blue piste back to the village. There are several slopes heading to Courchevel and Méribel, so you can easily get to one of these villages. If you do not feel like skiing you can make use of one of the free ski buses. These buses drive between the villages of Courchevel amd Méribel. If you want to spend a day not skiing, you could go cross-country skiing. 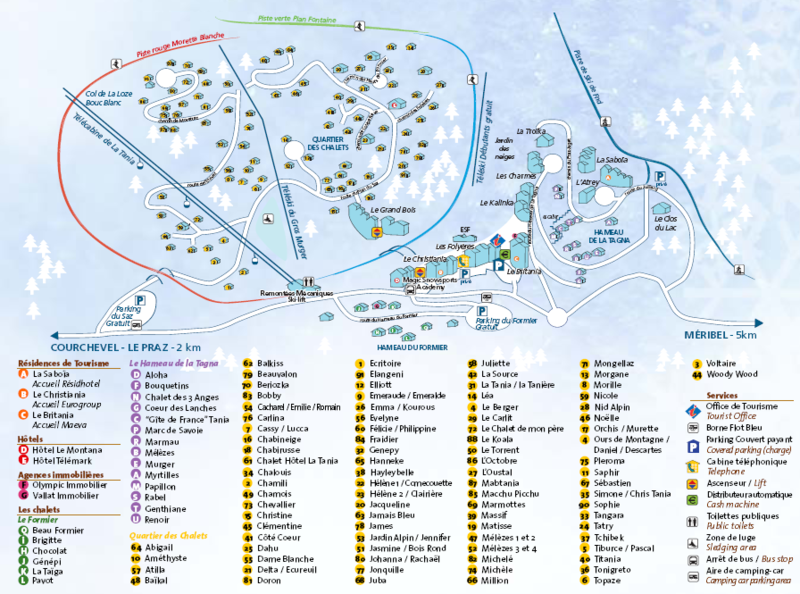 You could go to the trails in the woods near Méribel / Altiport, found at 1700 meters. In the local Tourist Office of La Tania, you can also request information about snow shoe walks, ice skating, sleigh rides etc.